Mr. Puigdemont’s decision to step aside — announced “with the greatest sadness” in a video posted on YouTube — ended one monthslong standoff, but heralded the start of another. He called on lawmakers instead to appoint Jordi Sanchez, another legislator from his pro-independence party, who is in prison in Madrid pending his own trial on charges of sedition. 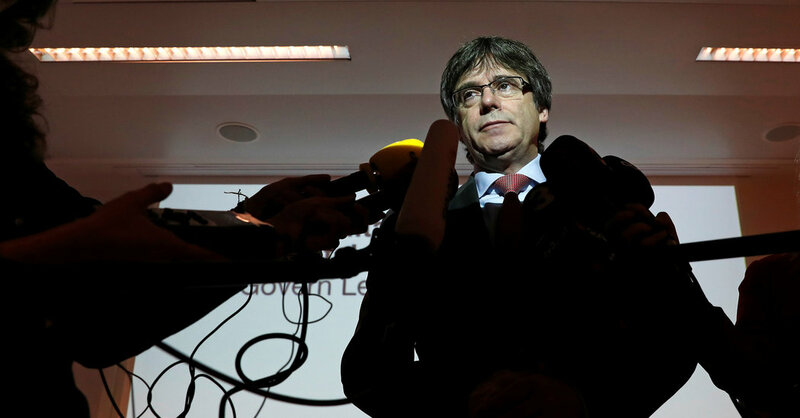 In public, Mr. Puigdemont maintained that he had the right to be president despite not being in the country, since the Catalan public had given the independence movement a democratic mandate in the December elections. On Thursday, he finally reconciled his private position with his public one. Yet his decision does not take Catalonia significantly closer to getting a new regional leader. The judge presiding over a case against several separatist leaders has already indicated that Mr. Sanchez and other jailed Catalan lawmakers would not be allowed prison leave in order to be sworn into office. Mr. Puigdemont, however, insisted on Thursday that selecting Mr. Sanchez was “the only way to agree on a new government in the current conditions.” He described his own decision to step aside as “temporary” and said that he would take his fight with the Spanish state before the United Nations, on grounds of human rights violations. The announcement created the latest in a series of seemingly irreconcilable differences between the region and the Rajoy government, one in which each has briefly outwitted the other, without either scoring a lasting victory. After the Spanish courts refused to allow Catalans to vote in an independence referendum, Mr. Puigdemont went ahead with it anyway last October. Amid confrontations between voters and Spanish police, only 43 percent of Catalans participated — but of those, more than 90 percent voted to secede from Spain. Several days later, Mr. Puigdemont then declared independence — before suspending his declaration moments later, hoping to draw the Rajoy government into negotiations. But when Mr. Rajoy refused to budge and instead called on Mr. Puigdemont to recognize the illegality of the referendum, Mr. Puigdemont and other separatist lawmakers declared Catalonia independent after all. Fearing arrest, Mr. Puigdemont soon left for Belgium. From his perch in exile, Mr. Puigdemont has tried to drum up support for the Catalan cause across Europe, but has ultimately found few willing to listen. No European Union official would meet with him publicly, and the handful of European politicians who spoke in his favor tended to be from separatist movements themselves. In Belgium, Mr. Puigdemont became a chimera of Catalonia’s expectations, an elusive Where’s Waldo-like figure whose appearances were breathlessly tracked by journalists. He was seen hiking in a forest near Brussels, and then spotted at a market in Ghent. He was photographed at the opera, and then dining at a restaurant close to the border with Holland. In a last-ditch attempt to foster alliances farther afield, he emerged one day in January in Denmark, where he met with a separatist politician from the Faroe Islands. But even that trip ended in frustration, after he was publicly criticized by a Danish professor, Marlene Wind, during a debate about Catalan independence. In Belgium, a Spanish broadcaster caught him texting a fellow separatist lawmaker about the hopelessness of his position. That was after the president of the Catalan Parliament heeded warnings from Spain’s judiciary and postponed a session in which Mr. Puigdemont had hoped to be elected. At the time, Mr. Puigdemont portrayed the revelation as a rare moment of self-doubt, and claimed that his position had not changed. Now, Mr. Puigdemont appears to have finally admitted that he has run out of road.